My friend Susan Beal from West Coast Crafty has one of the cutest homes I’ve seen. She made some super quick no-sew cafe-style curtains for her place using some pretty tea towels and clip on curtain rings. What could be an easier way to update your kitchen in a hurry? Susan embellished her curtains with some buttons and spangles, but you can just clip and go if you want! Check her page for the tutorial. If you haven’t checked the tea towel section of your dollar store yet, what are you waiting for? Have you noticed how many projects I post that involve them? You can usually find great seasonal dish towels, as well as many varieties and colors. super cute! between this and the curtains in susan’s new book, i’m really wishing i had windows that needed half curtains! i even have the cutest blue gingham tension rods that would be perfect for it! 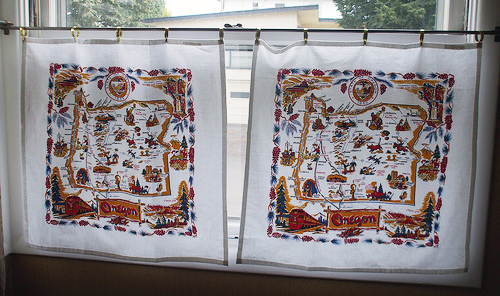 I wannnnnnnnt those tea towels SO Bad! I’m moving soon, so this idea will help out tremendously in our new place! Super cute.